For the parts of Europe which receive heavy snowfall every year, winter tyres are required to be fitted by law, and as such every car on the road is better equipped to drive safely in all weather conditions, including snow and ice. The UK weather is a little less predictable though, and as such the fitting of winter tyres is not required by law and is something which only a small minority of people choose to do. However the benefits of fitting winter tyres is huge, with a massive improvement in steering control, acceleration and, most importantly, stopping distances when compared to the regular low tread ‘summer’ tyres fitted to most cars and motorhomes. Anybody that has tried to drive a motorhome off a wet grass or muddy pitch will be able to vouch for the lack of grip provided by regular motorhome tyres in anything approaching slippery conditions. Plus if you intend on travelling to Europe in your motorhome during the winter months, or visiting more mountainous regions at any time of year, then winter tyres can be an essential purchase for ensuring you can drive safely in all conditions. Also as previously mentioned winter weather tyres may actually be legally required by certain countries during winter months, so be sure to check local traffic laws before crossing the border without the suitable tyres fitted. Winter tyres don’t come cheap (what tyres do?) A set of 4 is likely to cost upwards of £500 with fitting for a typical motorhome base vehicle such as a the latest Fiat Ducato. However, winter tyres can be used for a number of years as they only need to be fitted for the 4 to 6 months of the year which give us the worst of our weather. When not in use they can simply be stored safely in your garage or loft. In other words you can spread tyre wear between your regular set and winter set of tyres so especially if you plan to retain your motorhome for a number of years your overall tyre costs may not massively increase. It is important to remove winter tyres when the bad weather ends though as they will wear quickly in warmer conditions and that could prove expensive. 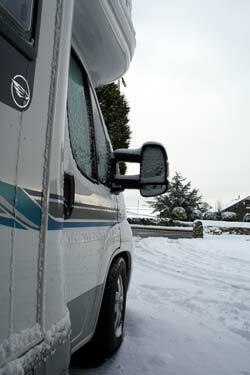 Not all motorhome types are listed though and obviously only Michelin tyres are recommended so our recommendation would be to speak to your local motorhome dealership (or the dealership where you purchased your ‘van) about which winter tyres would be best. For anybody that has never driven a vehicle fitted with winter tyres in wet or icy conditions, the improvement in control is something which has to be experienced firsthand, and an investment that we think few people will regret. *This paragraph was edited on the 23/01/13 to make clearer the difference between “Mud and Snow Tyres” and “Winter Tyres”. Hi again. In my previous comment I deliberately put inverted commas around “winter” M & S marked tyres. As I understand it the small mountain peak symbol is the only internationally recognised symbol for real winter tyres BUT, and this is where it gets complicated, some EU countries insist on what they call winter tyres from typically November to March. These legal requirements include M& S, M.S, MS etc etc on the sidewalls of the tyres. If you contact Luxembourg Auto Club for example they will try to “wise you up” on the different regulations in Germany, Belgium etc.. Being “next door” obviously their regulations are very important to them. Apparently France has decided not to attempt to bring in Winter Tyre regulations…. nothing is as simple as it appears!!! I don’t use my motorhome in the severe winter conditions but have a spare set of wheels with proper winter tyres on for my wifes car. I fit these about December and change back about March depending on weather conditions These tyres are essential due to her job of Home Care through back roads and country lanes. For anyone who has never tried “proper winter tyres” believe me they work. We have two identical cars, although mine is the older one and only used to commute a short distance to work on main roads. On snow or ice or even bitter cold days with wet roads the difference between the two is obvious. Better grip cornering and braking and a greater sense of safety. That one did make us chuckle Richard! Thanks to Neil for clarifying the article. Richard and Rhys raise the issue of mixing tyre types. Normal, Winter or Mud and Snow tyres should always be fitted to ALL wheels, not just the driving wheels. Mixing tyre types will result in dangerous vehicle instability and no reputable tyre company would do this. thanks for your feedback, I think the line about mud and snow tyres was a little confusing so I have edited that in light of your comment. I have also added a note at the end highlighting the change. Once again thanks for your feedback Simon, it really is much appreciated and helps us to ensure we are always providing the most accurate up-to-date advice possible. Whilst I agree with your article its content is factually incorrect and misleading. Winter Tyres are NOT the same as Mud and Snow Tyres – they are entirely different. Mud and Snow Tyres have improved tread grip and can be used all year round. Winter Tyres have similar tread but are made of a very different compound which should not be used above 9 degrees centigrade. Careful storage of tyres is required to prevent damage to them and this is not covered in your article. It may be wise to withdraw this until it has been corrected. I bought an Auto-Sleeper VW Topaz which had M & S ¨winter¨ tyres on the rear and summer tyres on the front (driving) wheels!!! Cornering was a bit weird. Coming to Europe this winter I put two new ¨winter¨ M & S tyres on the front and there has been a wonderful improvement in cornering etc.. This isn`t quite the same as your problem I know, in fact it`s really the opposite but I thought it might be interesting. In your case the braking effect in wet/muddy/snow might be worth having all 4 ¨winter¨ tyres on your van. With a Fiat front wheel drive and twin axle at the back; I’m wondering the merits of fitting winter tyres to the front only? Any thoughts?